Light Pass House gives you sole occupancy of a house filled with the charm of yesteryear. 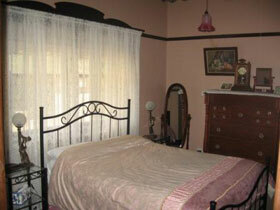 The 2 bedrooms have queen size beds, with one bedroom also having a bunk bed. Ideal for 2 couples or families. Catering for up to 6 people - (5 adults comfortably). Ducted reverse cycle air conditioning provides year-round comfort, with a slow combustion heater for extra-cosy winter nights. 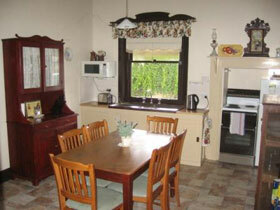 You can choose to eat in the country style kitchen, the dining room or outside. The historic village of Light Pass (Established 1845) is unique in that it has two Lutheran churches only 200 metres apart. Light Pass House is next door to the historic Luhr's Cottage, built of mud & straw (pug) in about 1850 - well worth a look! 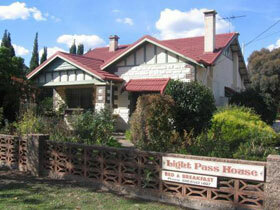 Light Pass House has numerous books to read about the unique history of the Barossa Valley. With discounted stays for one week or more (without breakfast provisions), Light Pass House makes great value for extended family holidays in the Barossa! Light Pass House is a roomy two bedroom home, decorated with old wares to retain it's charm of yesteryear, but including the modern conveniences you would expect. 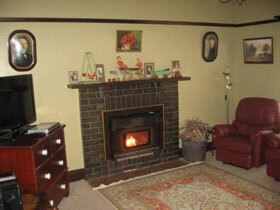 Ducted reverse cycle airconditioning assures you of year-round comfort, with a log fire for extra cosy winter nights. You can dine in the kitchen, dining room or outside under the huge walnut tree. Surrounded by cottage gardens. Relax and enjoy.